Your brand delivered to Your customer's doorstep, by us! Create branded cover sheets that keep you top of mind with your clients. Gift subscriptions will be delivered each month with your cover that personally greets each client by name while providing your contact information. Create a profile once. Your information is automatically added to each gift subscription created. Every month your branded cover with engaging content specific to that issue is mailed directly to your client. Take this opportunity to make your gift-giving work for you. Give your clients a gift they will look forward to each month, all year-long, instead of a one-time item. They enjoy reading each issue, you enjoy a full year of personalized marketing. We utilize Authorize.net for credit card transactions, ensuring quick, easy and safe purchases with the protection of complete PCI compliance. Our site utilizesSecure Sockets Layer (SSL). Visit our FAQs for more info. Get a marketing tool that keeps you in contact all year. 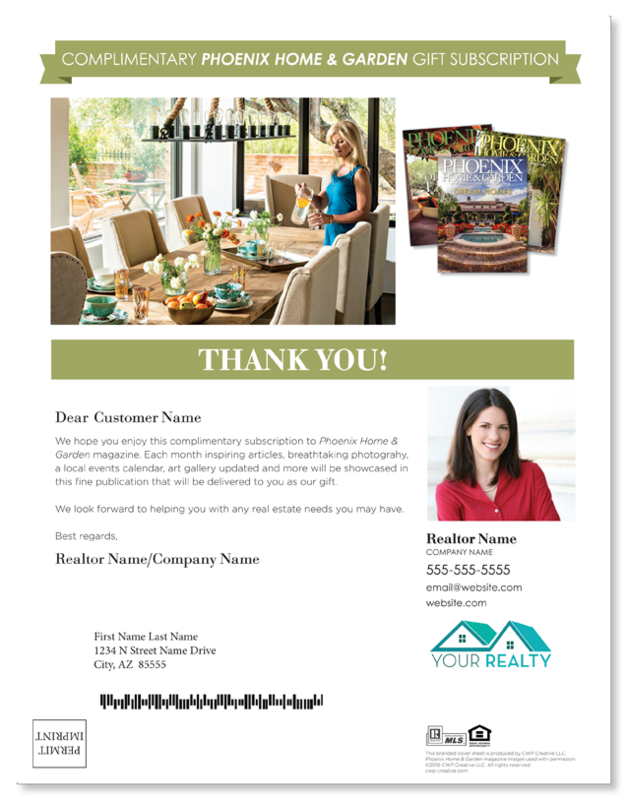 Upload your logo or a photo of your client’s home, or select our provided issue-specific image. Choose your headline for each subscription from a variety of colors available. Our format allows you to greet your client, clients, or group. Select your first month’s introduction copy, then enjoy professionally written content for the next 11 months. Add your current contact information. Need to update it? Go ahead and change your profile and all your subscriptions will update with the next issue sent. Add your company disclaimer information. Your name is added to the close. Recently a couple of our friends had the great idea to turn our product into a marketing tool for business professionals. Imagine your name, your face, and your company logo delivered every month coupled with one of our beautiful and content rich magazines - complete with a personal note. The mission of CWP Creative is to do just that! Phoenix Home & Gardenis the only magazine that celebrates the casual, unique and culturally rich lifestyle of the Southwest. Every issue showcases the most beautiful, well-appointed and innovative homes and gardens. Each issue of PHOENIX magazine offers unrivaled monthly coverage of dining, hiking, culture, events and local news. With a focus on all things local, PHOENIX magazine is a complete guide to life in the Valley.